How many quilty projects do you have going on at the moment? 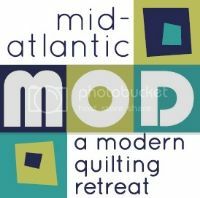 In the Philadelphia Modern Quilt Guild, there are plenty opportunities to work on multiple projects at a time. Group quilts, individual projects, guild challenges- there is always something to keep our quilty hearts happy! One upcoming event that has kept us busy is Mancuso's Pennsylvania National Quilt Extravaganza, which runs from September 14th – 17th in Oaks, PA! This Mancuso quilt show features workshops, lectures, a quilt competition, and special exhibitors like the PMQG. The Philly Modern Quilt Guild’s entries focus on modern quilts and modern traditionalism. We will showcase the pieces our guild has crafted and organized over the past three years. Keep an eye out for The Color Challenge mini quilts, Round Robins, Bee quilts, PMQG and MQG Challenges. A very inspiring article. I really like how you are promoting different opportunities for individuals. Goes on to show you are there for the empowerment. Good on you.